In the 2017 Toyota Prius Prime you will find a distance range-topping model with a plug-in hybrid powertrain from the world’s leading hybrid vehicle leader, Toyota. “Prime” = best, and when it comes to electric vehicles, there’s no doubt that sparks flew at the Toyota display at the recent 2016 New York International Auto Show, where the brand’s best-equipped, most technologically-advanced model to date was unveiled. Find out more about The All New 2017 Toyota Prius Prime on the Milton Toyota website. The Prius Prime’s manufacturer-estimated 1.96 or lower Le/100km (Litres equivalent per 100 kilometres) represents a substantial 22-percent reduction in fuel consumption from its predecessor, a result of greater battery capacity and an improved hybrid system. In hybrid mode, the Prius Prime is targeting a hybrid Le/100km equal to or better than the Prius liftback. The 2017 Prius Prime combines an electrifying design with an even more capable electric powertrain than the previous-generation Prius Plug-in Hybrid. The Prius Prime is expected to offer an estimated electric range approximately twice that of the previous model. 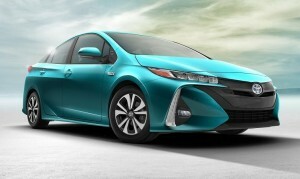 As sparing with fuel as the Prius Prime may be, it drives with the same verve as the standard new-generation Prius hybrid, one result of the new high-strength platform and double-wishbone independent rear suspension. Prius Prime adds even more premium touches and exclusive tech features compared to the all-new Prius hybrid, including its available 11.6-inch, HD central multimedia screen with standard navigation and available full colour head-up display. “Prime” also describes the vehicle’s advanced standard safety technology, Toyota Safety Sense™ P. This multi-feature advanced active safety suite, bundles the Pre-Collision System with Pedestrian Detection and Automatic Braking, Lane Departure Alert with Steering Assist, Full-Speed Dynamic Radar Cruise Control with full stop technology and Automatic High Beams. Blind Spot Monitor and Rear Cross Traffic Alert are also available for additional peace of mind.